It seems like a long time ago now, but when our happy band got together we set about creating a mission statement, a sort of who we are, what we do and why do we do it. Other organisations had such things and we thought we ought to have one too. As a teaching team, we wanted to help inform and educate and our mission statement for our work in schools reflects this. Every day we receive letters, drawings, photographs, pictures all sorts of things from school children. It is always a pleasure to see them. We encourage creative writing as part of our work in schools and as a result we get lots of thank you letters, stories and fact sheets sent in. Helping to encourage sentence construction and creative writing. We do our best to reply to all the questions we get asked and we try to make sure that everyone’s efforts are acknowledged. We have young dinosaur fans all over the world, we get correspondence from Scandinavia, Brazil, Spain, Germany, Australia, just about every country you can think of. 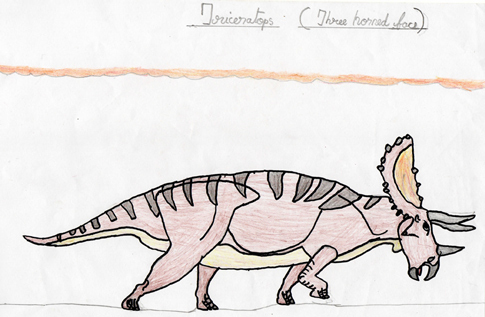 Super drawing of a Triceratops from M. V. Eashwar. In two weeks time the new school year starts and we can’t wait to meet all the enthusiastic palaeontologists during our many scheduled classroom visits to conduct dinosaur workshops.